the Great Brewster Woods Trail is for you. Best parking for this trail is right at the town hall on Highland Avenue. If your hike takes place on a day that the town hall is open, restrooms inside are a great convenience especially if you have children accompanying you. This hike may also co-ordinate well with a visit to the shops or restaurants in the center of town as it is only a short distance from these. marked by a sign that warns about mosquitoes. you to the start of the Great Brewster Woods Trail. 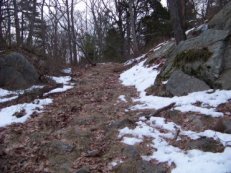 It begins quickly with a sweeping incline that begins root filled but becomes rocky and steeper. Younger children may very well need some help here. 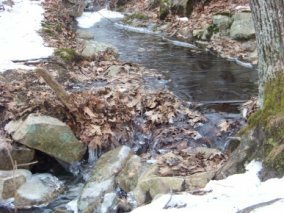 In cool or cold weather such as the day I explored this area, there may be ice to deal with as well. Most of the coastal towns are icy in the cold weather! 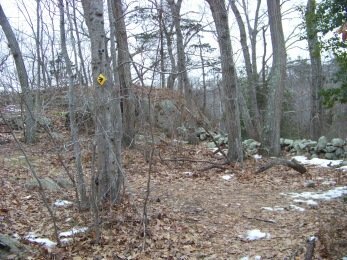 Once to the top of this climb you will find the trail head sign and the yellow diamond markers that lead the way on the official part of this trail. There will be a trail to the right at the top of the climb, but this is yet another access trail. 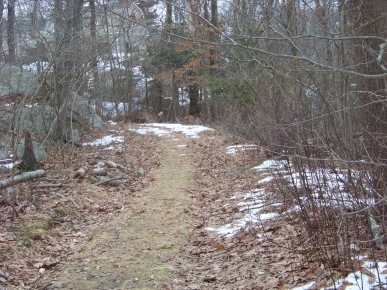 It leads out to the other entrance on Great Brewster Trail Rd. There is limited parking at that entrance and sometimes the area residents use it for extra vehicle parking. The Great Brewster Trail takes a left at this intersection. 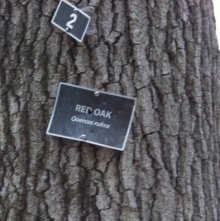 Soon you will begin to see more trail markers and occasionally signs marking tree varieties in this tract of forest. 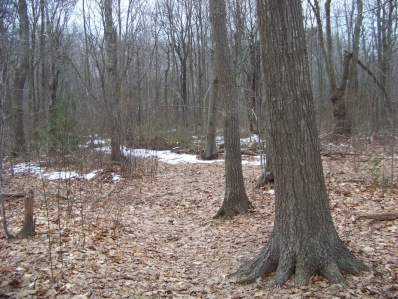 The trails are regular path sized and the forest is fairly dense in the summer. Like many forested areas there has been considerable amount of fallen trees. Much of this has been tended to. 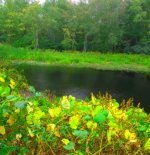 In the winter when the leaves are gone, one advantage is being able to see the natural landscaping. 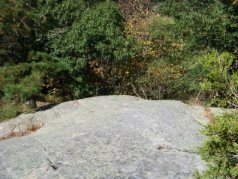 The first leg of this trail is along the top of a rock outcropping. Even on this upper elevation there will be a bit more uphill hiking and then down again. At approx. 1/2 mile there will be a hiking trail to the left that will follow out to a ledge. Another winter plus is that you can see the marsh when the leaves are gone. lunch when the weather is warm. 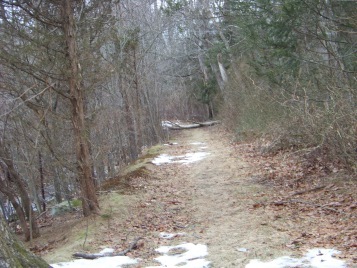 Back on the main hiking trail, it slopes downward and takes a right through a stone wall. 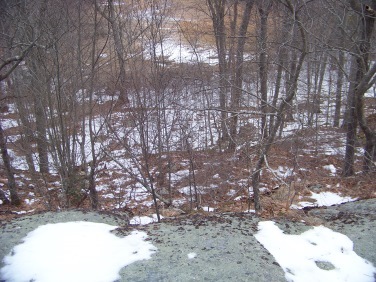 You will see a connector trail on the left before going through the stone wall that will bring you to a latter part of the loop. This could be used to shorten your hike if needed. If following the trail by the markers you will take another left shortly after the stone wall. These are mostly private ways. This cart path and trail are an access point to the conservation land for these neighborhoods. Please respect their privacy. Additionally all hiking trails leading off the cart path lead to private land as well. The cart path is interesting as it runs along the marsh seen from the ledge on the trail. 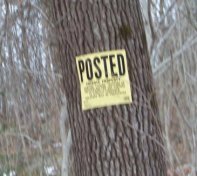 Once again, back on the trail, the yellow markers continue and bring you through an area that looks like it was a nursery at one time. Thick with bushes, it loops around and takes you through the lower part of the conservation land. with a slight jog to the left. the marsh. Across this stream is a bench. 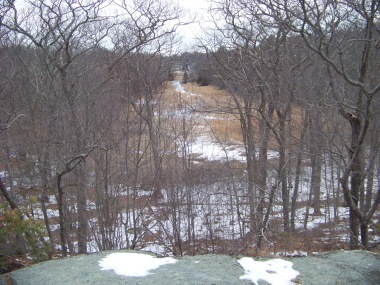 The rest of this portion of the trail leads past the marsh on the trail that could be seen from the ledge above. It then runs parallel with another shared driveway in the area. It looks like a dirt road and there will be many no trespassing signs along the way. 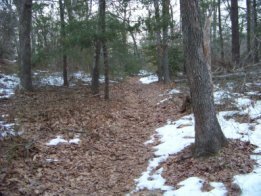 The trail will take a left and reconnect with the upper portion of the trail to follow back down to your car. Following the loop throughout with out deviating is a one and a quarter mile hike. Adding an explore of the cart path or ledge area will be extra mileage. from route 3A turn onto Sohier Street. Follow through intersection at lights and to end of Sohier. Take a right on North Main St. Highland Ave will be a left. Cohasset town hall is on the left. 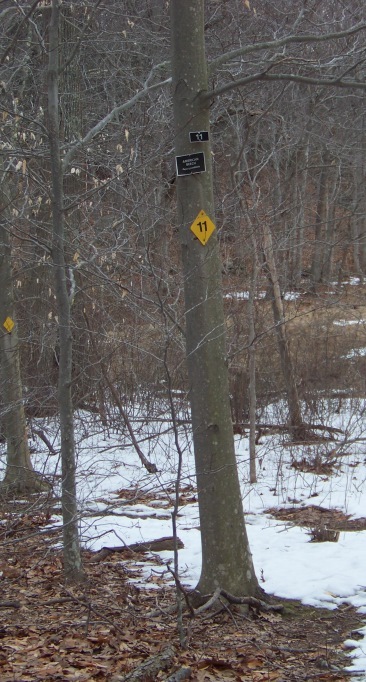 Trail is located by the council of aging vehicles. parking lot at town hall generally plenty of parking can be found here. 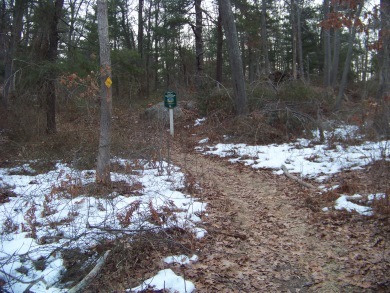 short: trail is 1 1/4 miles long. easy to moderate: rocky and some climbing and descending. 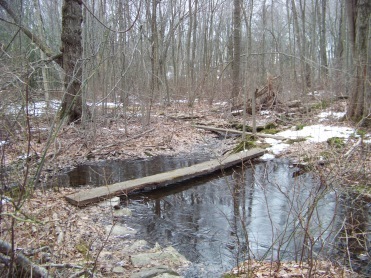 couple of small streams run through the area.